Windy City Poker Championship hostess Catherine Crane interviews film critic, Sun-Times columnist, and co-host of The Roe Conn Show with Richard Roeper on WLS-AM, Richard Roeper. They discuss poker, movies, and Richard's newest book, Bet the House: How I Gambled Over a Grand a Day for 30 Days on Sports, Poker, and Games of Chance . Catherine starts off with the "easy questions" in our behind the scenes look... sorry Catherine. The first time you heard this question, like me, you might have thought the other player was trying to con you. (Not a surprise considering the degenerates sitting at the table.) After learning more about the concept of “running it twice,” however, perhaps you were okay with it. So on which side of the fence should you reside? Although poker can be a highly psychological and even emotional game, the answer to the “running it twice” question, in my opinion, boils down to variance. I shall do my best to explain this concept in plain English (with some math, of course). Let’s start with an example. Windy City Poker Championship hostess Catherine Crane interviews ESPN Inside Deal Host Bernard Lee on family, his poker career, and charity events. Jason Finn, founder of Chicago Poker Club and Co-Host of Windy City Poker Championship, interviews spy-catcher, Special Agent Joe Navarro about reading your opponents. Joe is recognized as one of the world’s foremost authorities on reading non-verbal communications and he is regularly interviewed on programs such as NBC’s Today Show, Fox News, ABC’s Good Morning America, CBS’ Early Show, and for publications such as The Washington Post and Psychology Today. Kirk Fallah, Producer and Co-Host of Windy City Poker Championship, and special to Chicago Poker Club, interviews Annie Duke about Charity Awareness and the WSOP Academy. Flopped a Set, Disconnected Board, Folded on the Flop?! The article was originally posted on Chicago Poker Club on August 24, 2008. Last night a few of us headed to the Horseshoe in Hammond for a late night poker session. We had called about an hour + ahead to put our names on the list for a few games. In particular, I was looking to play $2/5 Pot-Limit Omaha, which was very good to me last week, but would play $2/5 No Limit Hold'em or $5/10 if it looked like a good game. When we arrived at the casino none of our names were on the list! Most rooms have a policy where your name is removed if you don't show for an hour, but several of the lists were over an hour long (! ), so I didn't anticipate that being the case here. The brush looked to see if we had been on the list (I presume that's what he was doing), but couldn't find us. He was kind enough to try get us close to whole again by putting us near the top of the list for each of our preferred games. The other fellas got into their games pretty quickly, as there were eight to ten $1/2 tables and a half dozen $2/5 NLHE tables, but I was on the PLO list, where neither of the two tables were moving at all. I was #3 on the PLO list, so I took a little walk and cam back to the room to find myself #4 on the list - WTF!?! Then I was just grumpy. I glowered at passersby as I hovered from table to table, area to area. Soon I got my name on the $5/10 list as well. After an hour or so I finally got on the feeder table for the $5/10 NLHE game (feeder, as in it was a must-move game). This was one of the softest No Limit tables I have been at in a long time, at any stakes. It was really incredible - I didn't know for sure that all of the players had actually played before. Unfortunately, when you're at a table of people who will play any pair to the river, you need to bring a hand, and I was short on them. When I moved to the "fixed" table I had slightly more than my original buy-in, around $1000. After an hour or so at the new table, playing solid, tight poker in position, this hand came up. I was in the small-blind and an old AC/Nashland good-guy, Jimmy, was in the big blind. The under the gun plus one was a pretty solid player who had amassed some chips through patient, solid play. He was not particularly agressive, but played pretty straight, stayed out of trouble, and won a few pots in the time I was at the table. I did not perceive him as someone who would overplay a hand too terribly. He raise to $30, a smallish raise. When choosing or creating a blind structure for your home game tournament, you're looking for a little balance - you don't want the tournament to run into the wee hours of the morning, or beyond, but you want to give your players the opportunity to play some poker. If every hand is "All In" or fold after the first hour of play, your guests aren't likely to be excited to come back to the next game. They want to enjoy themselves, and to play some poker - the better players want to diminish the luck factor as much as they can, and the new players want to give lady luck a little chance to breath, and the little lady at home some space to watch The Bachelor. Recently the brilliant minds at Chicago Poker Club have had a debate on how to best structure an event. The home game in question was attended by 29 players, more than have of whom were very occasional players, a couple of whom play two to three times a year in this particular home game. The other half of the field consisted of players who play 1-3 times per week, or have played 1-3 times a week at some point in the last couple of years. I'm oversimplifying a bit. The structure featured 30 minute levels for the first two hours, and then 20 minute levels thereafter. In general the blinds did not double, but increased by 50-80% per level, depending on the denominations. I contend that the structure is upside down - the levels should be shorter at the beginning of the event, narrowing the field a little more quickly, and injecting a little more luck early on. For players who were eliminated early, the more experienced players would like get a cash game going, and the less experienced players would either join the game (hooray for dead money!) or would decide they had spent their entertainment budget and move on... getting to enjoy the rest of their evening. This would leave more time in the later levels to increase the time to 30 minutes. When the field is thinner and the money is on the line, there would be more play in the structure. Mr. F feels differently. He suggests that a good deal of the players were non-regulars, and that they just came to have a good time. The longer the levels are up front, the more play they will get, the more the intent of the evening is served (fun versus intense competition) and also the more likely they are to come to the next event. He contends that the structure should allow the early levels to stay longer, to squeeze the middle levels of the tournament, and then potential roll back the blinds a level or two at the final table (remember that the final table is 1/3 of the field). What do you think? What do you prefer? Continue the conversation on the forum.. This article was originally posted on Chicago Poker Club on September 11, 2008. After a great day of sightseeing in the gorgeous city that is Prague, and a nice dinner with Mrs. Chicago and her colleagues, I headed to the Banco Casino on Na Příkopě in Prague, Czech Republic. The casino consists of two small floors, as do many of the so-termed "casinos" in Prague. The first floor is about 20 slot machines, and a staircase up to the second floor. Upstairs there's a registration desk and three sub-divided rooms. One room contains two black jack tables, a couple roulette wheels, two "stud poker" (a house game) tables, and some assorted machines and chairs, etc. The second room is the "player buffet", which consists of a few hot plates of unidentifiable Asian fare, surrounded exclusively by Asian players. The third room features some additional slots, and automated roulette wheel/interface, a bar with room for 4 or 5 bar stools (but no actual stools), a Wheel of Fortune, and three poker tables. The three tables were in use the prior night when I stopped in during a 1000 Kr ($60) re-buy tournament. This night there was one table in play, a 9-seater, with no open seats and at least 4 smokers smoking at the table. It was a NLHE table with 25Kr/50Kr blinds (~$1.50/$3) and a 2000Kr min and 10,000Kr max buy-in. Stole title from Joe Stapleton on August 11 episode of The Big Game. Ad Jd on a flop of Kd Qd Jh. $8 pre-flop, 4 callers - $40 in pot. Opponent goes all in for $1400. Vince asked how to play it, but without context of situation. Last week our good buddy Neil hosted a 30-player tournament in his home. He does these three or four times a year, and they attract a good bunch of amateur players, from the “I like poker” to the plays-one-a-week set. The structure in the event is a little difficult, and I’d like to assist Neil in tweaking. The first handful of levels offers a decent amount of play, with a reasonable amount of chips in relation to the blinds, and blind level increases every 20 minutes. At some point after the first hour or two, the blind levels decrease to only 15 minutes. The structure isn’t deep after Level 3, and blazing through four levels an hour, versus three, makes a difference. Case in point, we started around 7:45p with 30 players, and four hours of play later we still had 16 players remaining. The event ended with about two hours more of play thereafter. With a 30 player event constrained to an evening (figure 6 hours), I’d much prefer the structure to be tight early on (if I’m unlucky, I get my evening back, or get to play some cash games) and then much more relaxed when the player pool shortens up and we start to think about the money. We were down to 16 players and I was the chip leader with about 17,000 in chips (~28 big blinds), levels were 300/600, no ante (another place to improve the structure). Now with 28 big blinds and 16 players, being the short stack means there are a lot of short stacks. This means you need to be very careful about not committing your chips in a spot where a mid-stacked player can come over the top, and you need to make a slim equity decision (i.e. you’re priced in with a very mediocre hand, or dominated). Let’s start with Hand 118 (I’m making that up), where I’m the chip leader. Four hands later, I’m the next player to bust. 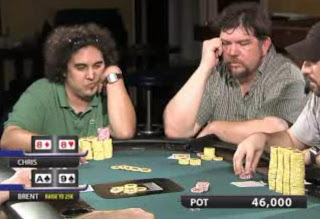 This post was originally published on Chicago Poker Club on October 23, 2008. Nine days into our Asian tour, Mrs. Chicago and I landed in Macau, via ferry from Hong Kong. The Hong Kong ferry is quite convenient – about a $10 (US) or less taxi ride from just about anywhere in Hong Kong and a $17 economy class ferry ticket – you can be in Macau in less than an hour. Macau was a Portuguese colony less than a decade ago, and the influence upon the Chinese administrative region is evident. The local currency is the Pataca (MOP) which has an exchange rate of 103.20 MOP to $100 Hong Kong (HKG). Everyone will accept HKG, and sometimes you’ll even get change in HKG; keep in mind you’re paying a 3% premium on the exchange rate. We landed in the arrivals hall and had to clear immigration, collect our bags, and clear customs. All were done in a short time, and we headed out to the taxi stand with little fanfare. We directed the driver to take us to the Sofitel, which apparently is not info enough. The beautiful Sofitel hotel came to be just 2 months ago, so most still know it by its former name, Pier 16. Everyone else has never heard of it at all. The accommodations were beautiful, high-end, and accompanied by top class service. One limiting factor is the hotel’s location at the far west end of the Macau peninsula, but the whole region is small and transportation, cheap. Our ride to the hotel, from the eastern coast of the peninsula to the hotel was 40 MOP, or $5 US. After checking in and grabbing a great lunch at the hotel, we headed out for a quick tour of Macau. We walked through a fairly prominent square and tourist area on our way to the ruins of St. John’s Cathedral. The ruins are worth a visit, as only the façade remains where a large cathedral once stood. The walk to and from the site provided us exposure to the local commerce and throngs of tourists. Welcome to the new Chicago Poker Club! Welcome to the new Chicago Poker Club! We are excited to unveil our more robust online community where players and fans can interact, participate, and read and watch exclusive and featured poker content. 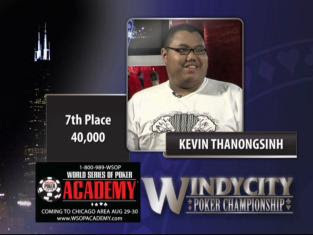 Through a partnership with Windy City Poker Championship, we will be offering exclusive video content and full episodes of the television show. Please take a moment to register an account, visit our forums, comment on our articles, watch our video, and drink our beer. On my first of two visits to Las Vegas for the WSOP this summer, one tournament garnered a special level of attention, not for the prestige of the event so much as for the content of the field. The majority of the 1,054 player field to was female, which unsurprisingly drew a lot of gawkers and onlookers. France's Vanessa Hellebuyck outlasted the field, defeating Sidsel Boesen of Denmark head's up, to take home the first place prize of $192,132. It was the minority of the field, the male competitors that drew the most conversation, digital ink, and the rage of many a player and onlooker. 10-15 men ignored the displeasure of WSOP organizers to take on the mostly female field, in poker and in verbal exchange. The State of Nevada's anti-discrimination laws prevent the WSOP and Harrah's from barring male players entirely, but did not prevent them from doing all they could to make the men feel ashamed and out of place. An Omaha Conundrum - Flop the Nuts, a Set of Aces, and Have 31% Equity! This post was originally featured on Chicago Poker Club on March 7, 2009. Ferret and I were just talking Pot Limit Omaha post-flop and I was musing about the sort of trouble you can get into with top set on a semi-connected board. One situation we considered was flopping top pair with second set, making it unlikely your opponent has top set. Another is flopping top set against two opponents - its good on the flop, and yet you have less than 33% equity in the hand. Both situations are employed in this example. Ferret is in the big blind, Gramps is in middle position, Scotty is on the button. Gramps is well behaved today, and just limps in with his 5h 7s 8h 9s. Scotty wakes up on the button with Aces, and another Broadway card which is suited. Ah Ac Qd 2d. He raises pot. Wil folds the small blind and Ferret finds 6s Ad Td 6d. 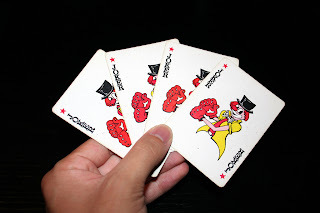 He has a suited Ace, two Broadway cards, and a small pair. He knows Gramps will call, so he figures he’ll take a flop. Day 1d will be this weekend at the Irish American Heritage Center, and will potentially be the last Day 1 flight with Chicago city limits. Brent is in early position with a medium-strength A9 off. He looks at his cards, and then contemplates his action, showing his opponents his diffidence while considering his options. He engages in what WCPC-friend and interviewee Joe Navarro would refer to as "pacifying behavior", holding his torso, lowering his head, and rubbing his opposite shoulder with his palm. He makes a small raise to 25,000 chips, and the action folds to Chris on the button, who has 88. Normally, I believe Chris would probably just call here with 88, after some thought, but in this case I believe he has two strong indicators to make a raise. What’s not tolerated in conversations: Things like foul and abusive language, threats against individuals, hateful speech, flame comments about products or services, and similar comments are strictly forbidden. Each of the "Day 1 Flights" plays down to 25% of the starting field, with the survivors moving on to "Day 2" which will be held in late November, followed by a "Day 3". Players may compete in any of the Day 1 flights, and players not advancing may re-enter additional Day 1 flights until they advance, if they choose. For more information, head to Main Event Charity Games.